As I've mentioned before, whether we homeschool our girls, send them to a local private school, or send them to our public schools, we know one thing is for sure, we will be making sure that they learn a second language. We've chosen Spanish to be that second language because of where we live. I've been searching for great Spanish language learning programs and I've found a few. One of the newer ones I have found is Little Pim. The series uses a panda bear named Little Pim to guide your child through everyday life. Using the Entertainment Immersion Method™, Little Pim leads Zoelle on everyday adventures through repetition. I have found the repetition to be the most helpful and useful thing for Zoelle to learn Spanish. Some things I absolutely love about Little Pim besides the repetition is the cartoon character of Little Pim himself. Zoelle seems drawn to the cartoon character and while we haven't allowed her to watch cartoons before, we have allowed her to do this as it is educational. We reviewed the In My Home DVD which is the 4th DVD in the series. This DVD is 35 minutes long and is broken up into seven 5-minute episodes which as anyone with little ones with short attention spans know, is super helpful. Without a doubt, I plan on buying the whole set to use for Zoelle this Fall when we do our little preschool time each day! She loves it and so do I! Feel free to keep up to date with all that is going on with Little Pim through their Facebook, Twitter, or Blog. 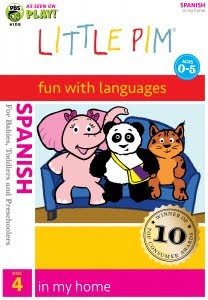 If you are looking for a language program to get your young toddler or child, check out Little Pim and one of their 10 (yes 10!) different languages that you and your child can learn! It looks like a great set! Do you think your girls are picking up Spanish from the DVD? Also - Are there any Spanish-speakers in your family or in your community? It's great that you're teaching your girls Spanish. I'm trying, but I have lost a bit of my mojo this summer. I now work outside the home which makes it a bit more challenging. Stephanie-Zoelle is for sure picking up Spanish from the DVD. Meridian is still a bit young, although if I say Hola to her she says "hi" which I am pretty sure she learned from hearing this DVD. No Spanish speakers in my family, but in and around our community there are many. Glad you are here, and hope to see more of you! Life as a family of 5! Wordless Wednesday: So in love!